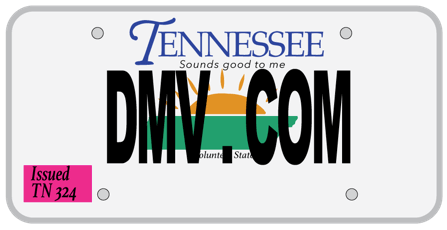 DMV.com was created to help simplify your life by providing you with all the vehicle related information and Tennessee DMV services you may need, in one place. Quickly find information and services regarding driving records, vehicle registration, drivers license renewal, license plate renewal, getting a learners permit, and finding a Tennessee Department of Motor Vehicles approved traffic school. Prospective drivers must obtain a Tennessee drivers license before getting behind the wheel. Learn about DOT drivers license requirements. Order your Tennessee driving record online today. Requesting a TN DMV driving record from the comfort of home is easy and convenient. TN drivers must have car insurance that meets DOT minimum standard. Visit our online car insurance center to find affordable car insurance. Take a TN defensive driving course online to fulfill a court order or lower insurance premiums. Our online traffic school is approved in Tennessee. Take a DOT practice test before scheduling your written drivers exam. Completing the TN driver practice test will help you obtain a license. Vehicle registration with the DOT is required for all Tennessee cars. Find vehicle registration information, including online DOT services. Tennessee drivers training courses show students how to drive safely. See how a TN drivers ed program helps you earn a license from the DMV. After a car purchase, a DMV bill of sale serves as a record of ownership. Learn how to obtain your car bill of sale from the Tennessee DMV. Unpaid Tennessee traffic tickets can lead to additional penalties from the DOT. Learn how to pay a ticket online in TN quickly and easily. A DUI conviction in Tennessee results in serious consequences from the DMV. Learn more about DUI laws and DUI consequences in TN. If you plan to purchase a car in TN, we have resources for you. Learn the advantages of buying a car online, such as easy DMV registration. You can obtain other DMV services at a TN DMV office near you. Easily find DMV locations and hours in Tennessee. Skip all that DoR’s bureaucracy. Visit DMV.com and go through its easy guides for drivers license, vehicle registration, license plate, emissions and other motor vehicle issues online. You have just visited the most easy-to-use guide to the Tennessee Department of Revenue. On DMV.com you’ll find the latest and most relevant info regarding info on driving schools, driver’s licenses, license plates, auto insurance, ID issues and much more. Our site is not a government owned website, meaning it’s not affiliated with any government agency, and we’re not stuck in government bureaucracy. Our main job is to get you all the necessary info in a way that’ll save you both time and effort. When it comes to searching for info about the Tennessee DOR, here you’ll find the data for every vehicle and all aspects of requirements or forms that need to be filled in. Whether you use the “search” feature or the navigation sections on our site, you’ll have no trouble going through the guide. You’ll always end up finding exactly what you are looking for. Keep with all the latest info about the Tennessee DMV by following us on Facebook. We also encourage you to comment, give us feedback and thus help us provide better quality.